Transverse view of one event collected with the CMS detector in 2018, with large energy from jets and large missing energy. 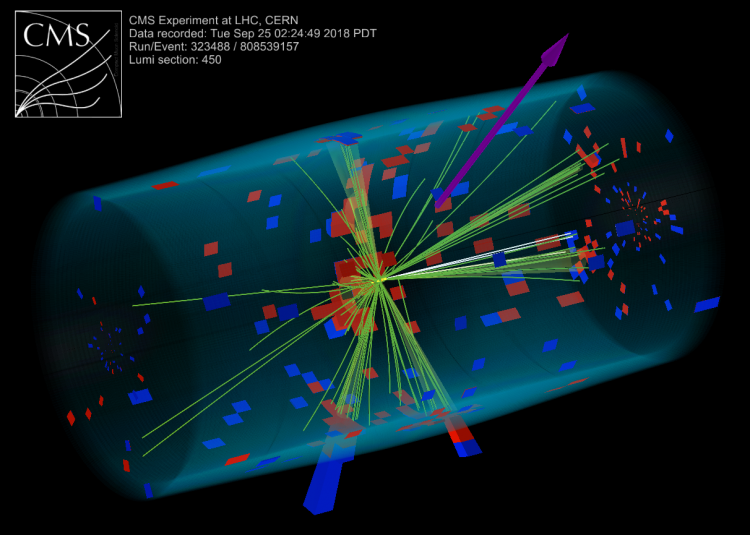 Three-dimensional view of one event collected with the CMS detector in 2018, with large energy from jets and large missing energy. Over the past century, physicists have developed a theory governing the fundamental interactions of elementary particles, known as the Standard Model of Particle Physics. Thus far, it has stood up to many experimental tests with an extraordinary degree of accuracy, including its prediction of the Higgs boson discovered at the Large Hadron Collider (LHC) in 2012. However, there are a number of questions that the Standard Model cannot answer. What is the so-called dark matter? There is evidence that the Universe is made by almost one quarter of matter that interacts very rarely, and is therefore called dark; the Standard Model does not explain its presence. Why is the Higgs boson as light as it is? Only with a significant tuning of the Standard Model, the Higgs boson can have a mass of about 125 GeV, that was measured at the LHC. It is due to these and other outstanding questions that physicists think that there must be more to the story: that is, what we call physics beyond the standard model. In search of answers to these questions, physicists at the CMS experiment have conducted a broad search for new physics in one of the first analyses making use of the LHC Run 2 dataset collected in 2016, 2017, and 2018. This, as of today, is the largest dataset ever analyzed by the CMS collaboration, corresponding to approximately 10 millions of billions of collisions. The analysis sifts over such data, searching for events with large amount of energy (from so-called jets), and a large amount of missing energy. Many theorized new particles would be invisible to the CMS detector (such as dark matter — that's why it's called dark! ), but physicists can infer their presence by utilizing the principles of conservation of energy and momentum. If there is a large amount of momentum imbalance in one event, it could be due to invisible (dark) particles moving in the opposite direction. Figure: Three-dimensional view of one event collected with the CMS detector in 2018, with large energy from jets and large missing energy. The main challenge in this search is that physicists expect many events with jets and missing energy that arise from known Standard Model sources, and these must be carefully accounted for. For example, a Z boson could decay to a pair of neutrinos which are invisible to the detector, and appear as missing energy. Events from known Standard Model sources are what we call background events, since those are not what we are looking for: physics beyond the Standard Model is what we are searching for. Invisible neutrinos are not the only source of missing energy: so-called fake missing energy can arise from imperfections in the detector hardware, or event reconstruction software, which lead to mis-measured jet energies. The multijet background from mis-measured jets is the smallest background to this search, but it is also by far the most challenging to model and predict accurately. For the latest LHC Run 2 iteration of the search, CMS physicists developed a new approach that involves smearing jet energies in a way that mimics the detector response to these jets. This technique allows us to build up a large sample of these mis-measured jet events, which we can use to study and make predictions. In a novel addition to this search, new physics signatures with disappearing particles were also searched for. Certain classes of new charged particles may have lifetimes that allow them to travel a few centimeters into the detector before decaying into something invisible. In the detector, this would look like a particle that simply disappears! A benefit of searching for this kind of signature is that it is produced extremely rarely by Standard Model sources. The signs of new physics we are looking for are so rare that some may have happened only a few times after 3 years of collisions at the LHC, despite the LHC producing roughly one billion collisions per second while it is operating. Since such potential new physics processes are so rare, it is crucial to reject as many background events as possible, in order to improve our sensitivity. Out of all the trillions of collision events, only a small fraction are selected to have large energy and missing energy. The selected events are sorted into a total of 350 categories, depending on their properties. Some of the categories contain thousands of events, others only a handful. Such categorization allows the search to be sensitive to a wide array of potential new physics models. We then compare the observed data events in each category with the predictions of the Standard Model background, looking for excesses: this is how new physics would show up. Observed data and predictions are found in very good agreement. While this means that there is no evidence for new physics, the result serves as further validation of the Standard Model and allows physicists to exclude certain classes of new particles. Read more about this result in the CMS Physics Analysis Summary.